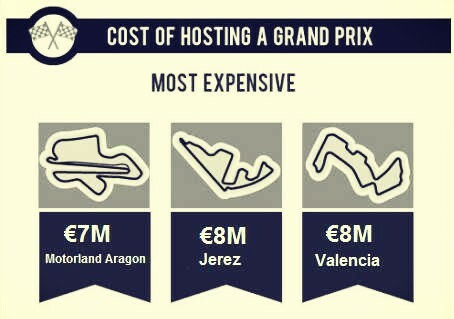 Average cost of hosting a MotoGP grand prix is around $7-$9 million a year. Qatar motoGP orgnizers has to pay around $12 million a year to Dorna to be able to host a MotoGP grand prix every year. We take a look at each and every circuit’s contract with “Dorna”. MotoGP is fast becoming mainstream motosport even in the world, every year there are around 20 races in a MotoGP calendar which takes place around the world. 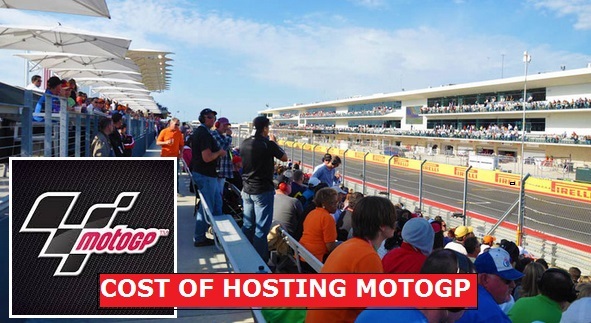 Today we take a look at how much dost it cost to host a MotoGP weekend and which race is the most expensive and which one is the cheapest among 18 grand prix’s announced for 2015 MotoGP season. A promoter (in most cases promoter and host circuit is the same) pays a specific amount of money to Dorna which is the parent company of MotoGP. The promoter (host circuit) than sell tickets and hospitality packages to recoup the money spend on hosting the grand prix. The circuit has to provide many facilities to the teams and motoGP itself for example circuit safety stuff, safety cars, first aid and trucks to name a few. So the fee promoter pays to motoGP is different from grand prix to grand prix. lets take a look at some of the most expensive grand prixs and a few cheapest ones. How Much It Cost to Host Grand Prix Weekend of MotoGP ? Jerez & and Valencia circuits has to fork out around $9.6 million to host a single grand prix weekend. Below table shows some of the contract details of circuits with Dorna.